Will ScaleBlaster work on all types of pipe? 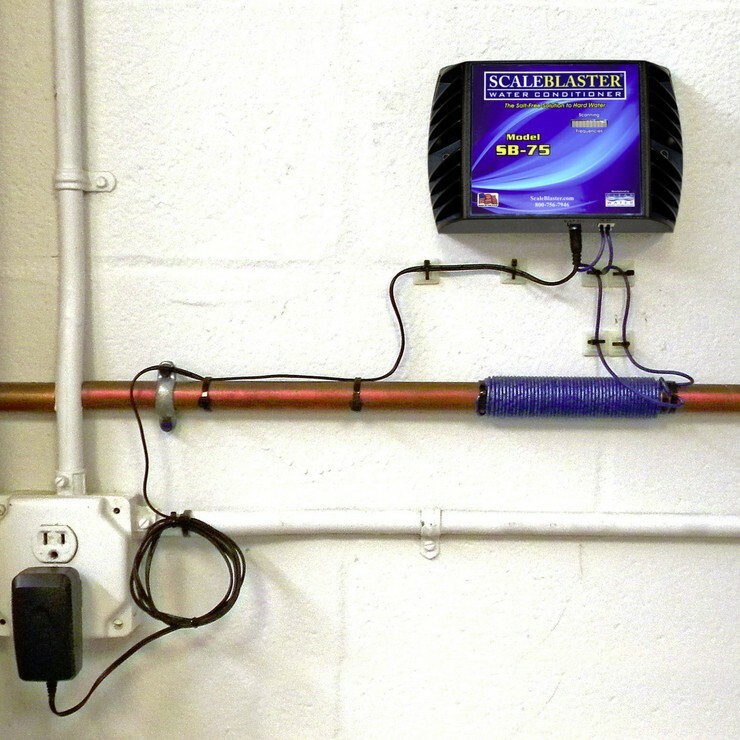 Our residential ScaleBlaster units will work on COPPER, PVC, CPVC, and PEX pipe. If you have galvanized pipe, you will need to replace that small section of pipe of where the signal cable is wrapped on the incoming cold water line with any of the above mentioned pipes. This only involves about one foot of pipe. Where do I install the unit? Install the unit on the incoming water supply line going to the house or building, and always before the water heater. You want to make sure all your pipes are cleaned out of limescale deposits. If you are unable to locate the incoming supply line before it splits, follow the cold water line back as far as possible from the water heater and install there. This may be the case if your home was built on a slab. How difficult is it to install ScaleBlaster? In most circumstances, the homeowner can install the unit themselves. No special tools or plumbing work is required. For slab built homes, you will need to locate the incoming pipe as it enters the house. The unit can be installed outdoors if needed, but make sure it is either the SB-175 or SB-MAX models, as they are in weatherproof boxes. Always contact your dealer if you have any questions. Yes, we are only concerned about the location where you wrap the coil at. The same thing can be said if you have galvanized and copper pipe. 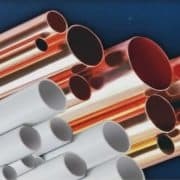 If the location where you want to wrap the pipe is galvanized, you will need to replace a small section of 12 inches with copper or PVC pipe. The descaling process will work downstream on all types of pipe after the signal cable location. Will a protective cover placed over the signal cable interfere with the signal in anyway? No, as long as it is a non-magnetic cover. Can ScaleBlaster be installed in the attic where it gets very hot in the summertime? We recommend the average air temperature to operate ScaleBlaster at 32 to 122 degrees F. The unit will operate at temperatures below and over those numbers, but not for long periods of time. The unit should be installed in an area that is ventilated. Is the signal cable a special wire? How can I get a replacement signal cable? Yes, the signal cable is a special wire and is not readily found in hardware stores. You can purchase additional signal cable wire packages from ScaleBlaster, which includes the zip ties. However, if you need a short-term replacement, an 18-gauge, tin coated stranded copper wire will work. My electrical outlet is more than 5 feet away from the only place I can mount the power box. Is there anything I can do without having to add another outlet? You can plug the ScaleBlaster unit into an extension cord if needed. Our ScaleBlaster units are UL and CUL approved. Can I wrap the signal cable wires on a main water pipe underground? Yes. Sometimes older homes built on slabs have little exposed pipe and this is an option. Installing the signal cable underground is not problem at all. The SB-75 power box will need to be installed indoors however, as it is not weatherproof. The area I want to install the signal cable has a coupling in the middle of it. How much of an issue will I have on the effectiveness of the product? We do not recommend installing the signal cable over a coupling. The wraps must be flush, and evenly against one another. Adding additional pipe to the installation area would be the best option. Can ScaleBlaster be installed in a well pump house? Yes. Install the signal cable after the pump for best results. I am planning to install the SB-75 power box and do not have much space. Can it be installed vertically or horizontally? It does not matter, either way is fine. 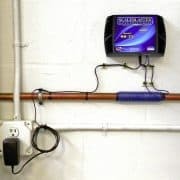 We do ask that the area is ventilated and not in a hot enclosed area over 122 degrees F.
Can I install the power box right next to the water pipe and where the coil is going? I know it has to be within ten feet, but I can put it within a foot. Can I install ScaleBlaster on two lines – I have one going to my house and one for the yard and barn? No, you cannot install ScaleBlaster on two lines. The signal is only strong enough to treat one line and one building the size noted. Please explain what you mean by “as far away as possible” from tees, elbows, couplings, valves and curved pipe when wrapping the signal cable? I do not have much room to wrap the coil. For the very best results, the less turbulence in the water is desired. By saying “as far away as possible” we prefer it to be a few inches away, if possible, but if there is no room to wrap the coil you can still wrap the coil next to the tee, elbow, or coupling. Just make sure it is not on curved pipe and wrapped over a coupling or valve, as all the wrappings need to be the same size or diameter and flush against one another. Can I extend the ten feet limit on the length of the signal cable from the coil to the power box? No, you cannot extend it. The ten feet of wire is the limit we allow from going from the signal coil to the power box. You will need to get the power box location and the coil wrapping location within those lengths. If needed, you can use an extension cord to plug the unit in if the electrical was an issue. Can I install ScaleBlaster on a copper pipe that is painted? Yes. There will be no issues if the pipe is painted or not. My house is on a slab. There is only 3 inches of pipe before it does a 90° into the pressure regulator. Can I mount it here? Install ScaleBlaster after the pressure regulator. I do not have 12 inches of straight pipe so I plan on re-piping the line at the water heater, but this line only controls water going into the heater. Is this OK? Yes, it is OK. You will be descaling the hot water lines, where the majority of the scaling issues take place. I just completed the wrapping of the coil and have a lot of leftover signal cable wire. Did I do this correctly? Having extra wire is expected. We always supply extra wire to handle the various pipe sizes and allowing up to ten feet of wire (in each direction) of where the signal cable is wrapped and the power box is mounted. The manual says I need to wrap the pipe 50 times. I don’t have room for that many. Is this OK? If you have no other possible options, wrap the coil as many times as you can. You might have slightly diminished results, but you should still be quite satisfied with ScaleBlaster. Remember, you do have a 90-day money back guarantee if not satisfied. If at all possible, do try to obtain the required numbers of wraps, and to never overwrap it either. I have room to wrap the coil more times than you recommend. Can I go ahead and do this and expect even better results? Absolutely not! Going over the recommended amount will actually diminish the strength of the signal. The amount of wrappings we recommend will give you the optimal signal strength possible. How big is the unit and how much does it cost to operate? Designed with state-of-the-art microchip technology, the ScaleBlaster takes up very little space and mounts on the wall. Yearly cost of operation is usually less than $10. How can I test my water hardness level? A simple calcium hardness water test will give the reading instantly. All pool stores will perform this test or have test kits for sale. Do not use the test strips as they are not accurate. Will ScaleBlaster lower the water harness level and the total dissolved solids (TDS) in the water? No, the water hardness level and TDS will remain the same. 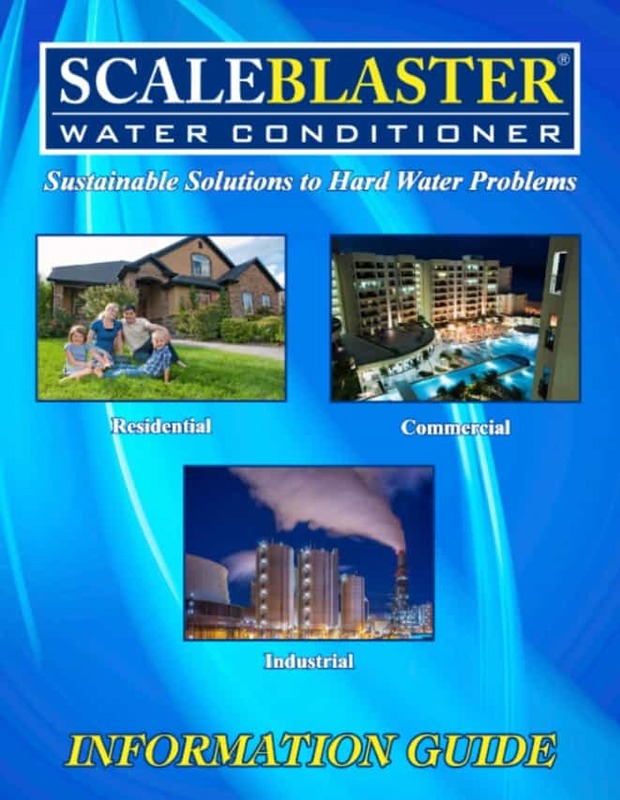 ScaleBlaster is a water conditioner –not a water softener. Water softeners remove calcium from the water, ScaleBlaster does not. Calcium is good for our metabolism, so why remove it? Where does the scale go when it is removed? ScaleBlaster dissolves the scale – molecule by molecule right back into the water – where it used to be, so the process is gradual. 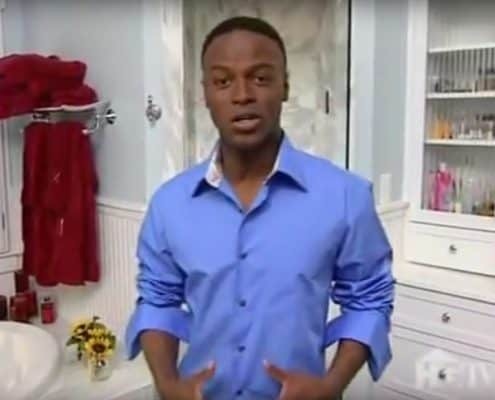 In a worst case scenario, your aerators may clog up a little in the showerhead or faucets. Simply clean them out and it should not be a reoccurring problem again. Will ScaleBlaster remove scale buildup in the pipe that is already there? Yes, over time it will. Depending on how much water the household uses and how bad the scaling is, the process takes about 3 months to fully descale the pipes. Does ScaleBlaster work better on copper pipe, PVC, or CPVC pipe? ScaleBlaster will work on all of the above mentioned types of pipe equally as well as the others. Is ScaleBlaster supposed to run all the time? Yes, unless you are gone for long periods of time, such as a second home and want to unplug it. It is entirely up to you. How much electricity does ScaleBlaster use a year? ScaleBlaster will use about 15 watts of electricity – about that of a nightlight. Depending on the cost per KWh, the average house would use about $8.76 a year in electricity. Will there be any maintenance with the ScaleBlaster? There is no maintenance at all. No salt to carry around. No batteries or filters to change. No moving parts. You may want to occasionally check to see if the two LED lights are on in case of a power surge. Otherwise, we do suggest you drain and clean out the bottom of your hot water tank after a couple of months of installing the ScaleBlaster to remove all the scale that has accumulated. I have a water softener. Do I still need ScaleBlaster? This depends on several factors. 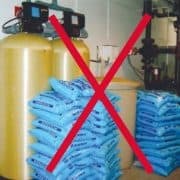 If you enjoy the extra soapsuds produced by the water softener, then definitely keep it. The ScaleBlaster will create extra suds, but not nearly as much as a water softener. If you live in an area that is banning water softeners, then you have found the number one alternative. If the cost and maintenance on a water softener is bothering you, then again, this is your number one alternative. If a doctor has put you on a salt restricted diet, again ScaleBlaster is the answer. My friend says he tried a unit similar to yours and it did not work. Any ideas? There are similar products to ScaleBlaster on the market that claim to do the job, but don’t. Years of product research went into the design of ScaleBlaster. Our product utilizes frequencies far wider and with more energy levels than any other competitor. ScaleBlaster is the number 1 selling “electronic descaler” in the world today because it works. ScaleBlaster has been manufactured since 1995 by Clearwater Enviro Technologies, a company founded in 1989. 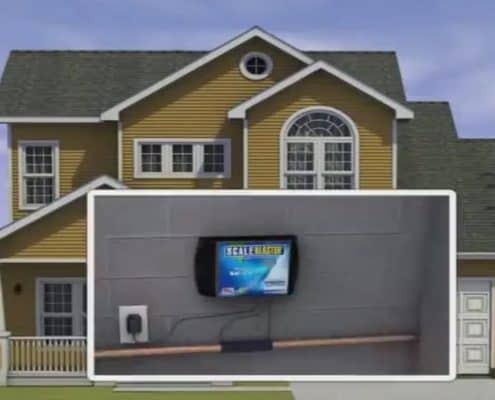 The product was featured on HGTV in 2005, and is carried by many large retailers, plumbing supply houses, hundreds of dealers and is used by Fortune 500 companies, major power plants around the world, breweries, cruise and naval ships, universities, hotels and water parks. Before I buy, what kind a guarantees can I get from ScaleBlaster? The unit comes with a full 90-day money back guarantee, and has a full 5 year warranty on the SB-175 and SB-MAX models, and 3 years on the SB-75. Additional warranties to extend those terms are very reasonable. I just installed ScaleBlaster and was wondering when I can expect results? To realize the full benefits of ScaleBlaster, please allow up to a couple months. The descaling process does not happen overnight. This is why we offer a full 90-day money-back guarantee. If you ever have any questions on the installation, please do not hesitate to contact our customer service department. You can email us photos of the installation for analysis if you have any questions. Depending on the circumstances, you may notice more soap lather, a softer feeling on your skin and hair, increased water pressure and “hotter” water. This means your water heater will be working much more efficiently now. Does ScaleBlaster work on other applications besides houses? Yes. ScaleBlaster works on hundreds of applications in the commercial and industrial fields where lime scale formation is an issue. There are several models that can handle up to 48” pipe. Units have been in use in over 70 countries since 1995. Many of the world’s largest companies use our equipment. Applications include power plants, cooling towers, boilers, wastewater treatment plants, cruise ships, hotels, agriculture, military plants, health care facilities, condos and much more. I left for the holidays and came back and noticed my water did not feel the same as before. Did I do something wrong? ScaleBlaster will hold a charge to the water for about 110-hours. Once you use up the existing water in the water heater, you will be back to normal. This will not affect the preventative maintenance of ScaleBlaster. Does ScaleBlaster help with rust stains? We get many people who claim ScaleBlaster helps out on rust stains, but have no scientific proof that it does. If the stain is part of a calcium/magnesium deposit, it will go away when the calcium/magnesium is dissolved. Does ScaleBlaster work with high iron or sulfur content? Will it get rid of the “rotten egg” smell? ScaleBlaster will not affect iron or sulfur in the water, nor will levels of iron or sulfur affect the unit from working. It will not remove iron or sulfur from the water. While we get many people who claim it got rid of their “rotten egg” smell, we have no scientific proof of this. Does ScaleBlaster remove or kill bacteria? 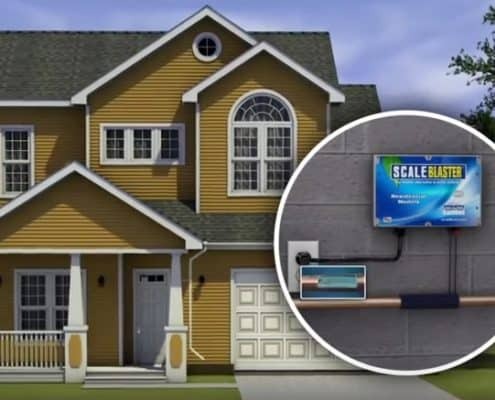 ScaleBlaster does not kill bacteria, but it does remove the main breeding ground for bacteria – lime scale formation in the pipes. When the scale is removed, so is the breeding ground for bacteria. Does ScaleBlaster affect the taste of water? ScaleBlaster will not remove anything from the water. We only affect the calcium and magnesium molecules. ScaleBlaster will not remove chlorine from the water. We do however, get many complements that the water tastes better – perhaps from the breeding ground of bacteria being removed. Again, there is no scientific proof of this. 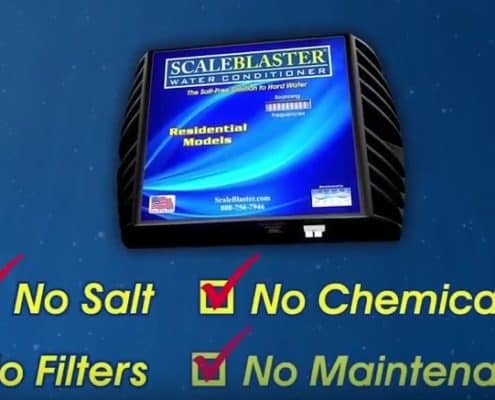 ScaleBlaster is the Salt, Chemical & Maintenance FREE solution to hard water problems. https://www.scaleblaster.com/wp-content/uploads/2018/02/image-02-14-18-11-24-11.jpg 437 695 ScaleBlaster /wp-content/uploads/2016/08/ScaleBlaster-LOGO.png ScaleBlaster2018-02-14 11:25:342018-02-14 11:29:51ScaleBlaster is the Salt, Chemical & Maintenance FREE solution to hard water problems.